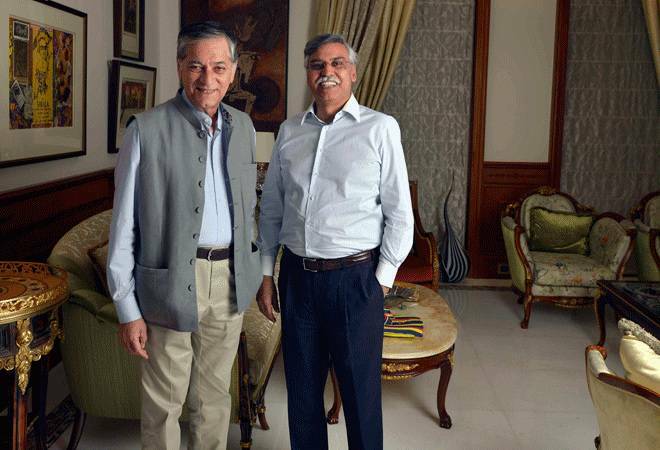 Right after having their bid selected for the Fortis Healthcare, Sunil Kant Munjal and Anand Burman talked to Business Today about why they chose to bid for the company and how they plan to turn it around. Within hours of the Fortis Healthcare board announcing the Munjal-Burman bid as the preferred bid to take over India's second largest hospital chain, Sunil Kant Munjal and Anand Burman sat down with Rajeev Dubey & Joe C Mathew to explain what convinced them to bid for the company mired in allegations of poor corporate governance, their apprehensions and how they plan to turn around the struggling healthcare chain. Also, whether they are financial investors waiting to flip the company for a better price. Or, whether the Singh family can come back into the company at all. The eight-member Fortis board was split 5:3 in favour of the Munjal-Burman offer which had proposed a binding offer, infusing the highest Rs 1,800 crore into the company without any due diligence. More than Rs 1000 crore of that will be invested in the form of preferential equity allotment and warrants right after the shareholders approve the proposal. Many structures were proposed by bidders to separate the assets so that they are not affected by the ongoing investigations or past legal issues. But you proposed to invest in the company itself. How are you comfortable with that? We think the extent of the problem now is probably less and not more than what is normally assumed. Because some money has also come back recently. Which is a good sign. Whatever be the reason, if some of it is coming back, then hopefully some more will. In case any of the other deals came through, and they wanted to separate this entity or that entity, it's an 8, 10, 12 month process, plus a merger process, by that time the company is finished. At this moment the company does not have the strength to stand on its feet for too long without getting external support. Which is also why our offer was found more suitable than others. Because ours was the only one that was completely binding, only one which says I am putting the money in the company, no questions asked, and we are doing it right away. Ours was the quickest to get money into the company. And of course it comes with the experience of the two groups which have come with large experiences of all kinds. Publicly, what we have announced is limited to a few businesses, but we do many, many more things. Its problem has turned this into a unique opportunity also. When did you decide to come together? Munjal: We are very old friends, very close friends, both as families and as individuals. We have often talked of doing something together, though never did anything together or looked at it seriously. Of and on, we have said, oh what about this opportunity. It's just providence, both of us looked at it separately, and when we had a conversation, we said this is perfect. Both of us are interested, we have been talking about doing something together, and here it is. And let's do this. Burman: And this was exactly two months before. Do you anticipate any resistance from the minority shareholders? Being minority stakeholders, we know what is good for minority shareholders. When did you buy this 3% equity you together already have in the company? Burman: Over a period of several months. Ever since the share price began to fall. It's still a very valid proposition, that has not lost its place at all. And if you can have some part in the growth (of Fortis), it is an even better proposition. Munjal: We have an interest in education and healthcare for a long time. Over 30,000 kids are studying in our schools right now. We run B.Ed, M.Ed medical, nursing colleges. We have a university - B M Munjal University. Besides this I am involved with many education institutions outside. I am on the board of IIM Ahmedabad, I chair ISB's Mohali campus, SRCC, the whole bunch of them. In healthcare also, I chair the board of Dayanand Medical College and Hospital, Ludhiana. We have invested in a large number of entities around healthcare technologies. So, we did not want to start a green field project, because to build a green field project in India is a very tough and complex thing. First, acquiring land is difficult, then getting all the permissions and clearances in place is a long, drawn out process. So this looked like a good opportunity. It was set up very well as a high quality asset. In scale, it is the second largest in India. Not only that, it has very good potential, the way it is being set up. It has got teams of doctors and nurses, good facilities. But it suffered over the last couple of years due to reputational reasons, credibility, all kind of innuendo and finger pointing, and now of course, there are SFIO investigations going on. So we looked at it a while ago. Why didn't you proceed then? We did approach twice. The first was the year before last, and the other was early last year. We backed off for two reasons. One, we were not allowed diligence. The other was the Daiichi case. The issue was going on, and Daiichi had made it very clear that they will go after anybody who becomes the owner of any asset that is currently owned by the Singh brothers. So we said, it is not worth it. They had already won the case in Singapore, a case going on in Delhi, and they had a battery of lawyers working on both sides. So we said we don't want to walk into something like that. Now that the Daiichi overhang is over because their ownership has dropped down to near nothing, and the best of it now becoming a public knowledge almost, and with public investigation going on, you can be sure that whatever is not okay, will come out. So our comfort, it is unfortunate to say this, but our comfort comes from the fact that it has now broken out into an open problem. It is reasonably a public secret now what the problems or shortfalls (of the company) may be. There is enough public pressure now, we believe, at this stage. For anything wrong to be done would be very difficult. It is in public glare, there is so much media attention. In India, in recent times, I have not seen any asset looked at so openly in this manner. When we started we were thinking it's quite a transaction, but along the way, it became hotly contested, which also gives one a comfort that it is a good asset. Because these are companies who have done the diligence, 18 months each of diligence. That gave us further comfort that people, who have done this for 18 months, are still interested and offering this kind of pricing, then we are on the right track. We are not doing anything grossly out of place, that's our belief. Plus, in a country like India, healthcare is crying out for attention. We are not reaching enough Indians with healthcare, and the quality of healthcare in India is still behind what it should be. So we thought that if we can bring our knowledge, our expertise, our experience, not just of healthcare, but of running large diversified enterprises, dealing with large number of people, with varying backgrounds, running systems which have good supply chain, good procurement, good management systems, we believe it's possible to not just slow down the decline, but generally get it to where it goes back and becomes one of the leading healthcare institutions in India. Have you structured your partnership? Yeah. We have an internal arrangement of how we are going to operate. Nothing that we can share at the moment. Is it an equal investment? We are not announcing that either. But definitely we are going to work together. We will be designating persons in concert (agreement) also so that it is seen as one block. But your investments remain separate? Coming to Fortis, what exactly are these 30, 100, 365 day plans that you have? We're not, at this moment, able to share details but I can tell you broadly. Because, we have no locus standi at this point to make a plan for the company even though we are 3 per cent shareholder. But we are just minority shareholders. We're hoping that once our investment goes in and we have 3 members on the board, that they will be able to share with the company a set of ideas which could help the company in the immediate short term, the short term and the medium term. The plans are around systems and process, technology, centres of excellence, hub and spoke systems. Some are very technical on healthcare, some are management related, some are to do with soothing the entire system. Right now there's also a little bit of ruffle, uncertainty around this. People are nervous. To soothe the nerves in the system first. Both Anand and I got many calls saying this is a fantastic thing. It was heartening to hear that. Generally, it seems to be going in the right direction. But we'd like to do it in a conservative manner, as we've done most of our things. Think long term but action on an everyday basis. Remain conservative in your approach. Don't over-leverage but quick action. If something has to be done, we will do it. But we will do it sensibly. We'll do it for reasons of business. Not for any other reason. We're not doing it to show to anybody. We'll always do the right thing. Are you backing the plan to acquire the RHT assets? RHT is a very obvious thing to do for 2 different reasons. One, that parts of this hospital are actually owned by them. We're operating the hospitals without owning it. Second, the moment you bring that in, your margin bumps up quite dramatically. The cost to that is quite high. Yes, we will support the company to buy that asset back. What happens to any regulatory or any other questions that are raised or liabilities related to that? We'll cooperate with all the authorities. The company is always liable. If there's a misdemeanor, the company will be liable. If some investigations are pointing to the previous promoters, that will be personal to them. If we come into any key position then we have to take responsibility for the company. We'll extend full cooperation to investigation and we'll do what is the right thing to do. We want to bring care back into the system. Remember, you are dealing with people. You are dealing with people who are emotionally damaged. If you are injured, if you are sick and you come to a hospital, you are frazzled already. So we want to make it a little bit more humane. How can you create a system where you not only take care of a person's disease but also the emotional state. If you focus on the care, the business becomes healthy. But we have very marginal interaction with the promoters. Obviously we meet them at social functions. But we have no other dealings. When we approached them earlier, it was we who had approached them. But they said no 'due diligence', so we walked away. So there was no real detailed conversation. We would have actually liked to have a conversation because we were interested. This time we've had no conversation with them because they have no role now. We've met with the board. We've met with the teams that are running the management. We've met with some of the investors. We've met with some of the doctors. But the very fact that they denied diligence, do you think it was more to do with the emergency to infuse cash? It's hard to say that. Probably was. It's only speculation now. Sometimes, on hindsight you get smarter. We still don't know. They said so much diligence has been done by so many people that we don't have the time. So we said ok. Then we're not interested. We'll walk away. But this time we're saying despite that, here we are because the opportunity has actually changed now. Will there be any role for the Singh family in Fortis? No. They have no role now. What about Brian Tempest, Harpal Singh? What we saw was frankly fairly independent. I saw him 2 days ago when we made the presentation. To me he seems very independent. We don't know how much of that is new or was he always like this. I don't know. But he frankly sounded very independent. Harpal also, interestingly, is Malvinder's father-in-law. The conversation with Harpal was where is the problem, what is to be done with SRL, why is this important, what can you guys do when here. So our conversations have all been around how do you make this much more efficient and a flourishing enterprise. Also, if you look at the board right now, they are under such a magnifying lens that if they behave anything other than independent, they're going to be in trouble. Are you looking at changes there? I don't think we need to, once we have a larger board. Three new board members have already joined. Once three more of ours join, the board will be right-sized. It was too small. There were only 4-5 of them. That was not normal also not normal for a company of this size. So if they were to do any hanky-panky, they'll be minority in any case. Frankly, I don't think anybody would do anything right now. My personal belief is nobody will try anything wrong. First, our system doesn't allow it and they're all quite conscious of both of our companies and their reputation and their style of functioning. We've learnt that you could be working with the most difficult people and you can have the most wonderful working relationship still. We made two comments there. One, we've said where we stand looking at this from outside. It is clear that SRL needs attention to grow. SRL is a large system, the largest in India. But it still needs attention. It's not growing as much as the other competition. The hospital itself needs attention. Is there enough bandwidth? We don't know. If there's not, then we would recommend that this is sold so that the focus remains on one thing. But as we get closer, as we understand more, when we have people on the board and we are able to talk to the board and the management of SRL, if it makes sense to retain it we have no problem retaining it. We're not going with a fixed mind. We've expressed a view that if it's going to divert attention, it should be sold. We have to have single minded focus to build Fortis first. That's what we are getting into. SRL is an allied business. If it's possible to build both without losing attention on either side, then that's great. If not, then it should be sold. Are you seeing yourself as a financial investor or a strategic investor? You are not looking at it as an asset that you'd like to flip over some time once you have steadied it, stabilised it and when value is better? We're both long term players. If you look at all of our entities. Family office is the vehicle for making the investment. In both our systems, what we do is we mark what funding is available where, which entity will make the investment. That's all that's relevant. It doesn't decide what you're doing to do with the business. These are two completely different things. One is where the money is coming from, what you're doing with that money. Our operating companies are also invested from our family offices, by the way. At the EGM, do you expect any hindrances, whether from other shareholders or minority shareholders, whether this deal should go through at all? There's no question of a better offer. The board has recommended this. There's an expert committee, there are external advisors and then there's the board. Between these three groups, the board has recommended our offer. It will now go to the EGM. If it passes in the EGM, everything is over and done with. If it doesn't pass in the EGM, then you go back to square one. I don't think the company can afford to do that. I'm sure the shareholders realise that.